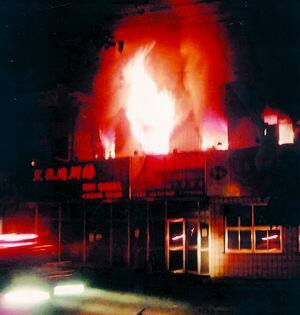 “A fire engulfed the unlicensed “Lanjisu” Internet cafe in the university district of Beijing in the early hours of June 16, 2002. (read more at: http://www.wsws.org/articles/2002/jun2002/chin-j22.shtml) 25 college students died, and 12 injured because of the fire. How did the fire started? Two teenager attempted to rob another student who they considered “rich” in the Internet cafe, and were kicked out by the cafe manager. The two then set the cafe on fire. After the two were arrested, they confessed that their purpose of robbing the “rich kid” was to play game the Internet cafe (Investigation revealed that these two where from families of below-average economical situations, visiting Internet cafe was considered pricey for them). From the points stated above, did you find anything overlapping from point to point? Yes. Internet and games. The Internet and the games lured all the students to a place like an Internet Cafe; the Internet and the games kept attracting people like the two teenagers to visit; and of course, the Internet and the game cause the death of 25 young people. After this tragedy, Beijing banned entrance of Internet cafe to anyone under 18. Thus as a 8th grader, I could not get into an Internet cafe after school back then. However, I had other options, I could either go back home and play games or stayed on campus to play some basketball. I wasn’t either frustrated or desperate, but not anyone were sharing the same mentality as I was: students began to forge fake IDs to get into Internet Cafe and started to skip class for that. As one can predict, for most of the times, they get busted by the entrance of Internet cafe or on the way out of school. Shortly after that, nearly all domestic media were scapegoating the Internet and games for being such addictive substances for the teenagers/students, while the fact that students don’t really have a life outside the campuses was ignored. You wonder why Internet and games were so “addictive”? Go find out how many students’ spare time was taken for excessive study sessions in China. Again, this is nowhere close from the time when sh*t really hits the fan. Two years after the “Lanjisu” tragedy, an 8th grader committed suicide by jumping off from a 21 story building (read more: http://www.foxnews.com/story/0,2933,195236,00.html). The 8th grader’s dairy revealed that he was a big fan of Warcraft 3, and considered himself as a warden. More importantly, it is suggested that he considered his suicidal behavior as ritual of resurrection and the top floor of the building he lived in was his”altar”. Before the death, the kid’s parents did not oppose him when it comes to games, however things change, and gathered the public’s attention. As you could predict, games are there to take the blame. The domestic media once again led the public to focus on how “games are confusing the under-aged citizens when they are trying to distinguish fantasy from reality.” Isn’t helping the children to distinguish the differences a job for the parents? where were they while they son was leading a group of Night-Elves to fight the Orcs in both the game and the reality? Apparently it is easy to blame something that doesn’t talk back, in this case. The gaming industry did not talk back, and do you know why? Disregarding where the games were developed/made, when they were imported to China, they would be distributed and sold by Chinese, who were sharing the same mentality as the angry parents did. They felt guilty for what happened to the unfortunate youths when the tragedies were related to gaming. However, should they bear such burden? Why Pitching to the Dragon? Contemporary gaming in China, Pt. 1: How Chinese web-based games ads are ruining it.